If you’ve stuck with us for a while (and you get our endless gratitude if you have), then you’ll probably have seen our fair share of takes on all kinds of movies. Whether they’ve reached the heights of Gravity and Calvary or the lowest of lows with Diana or Annie, they have all been classified as movies all the same. 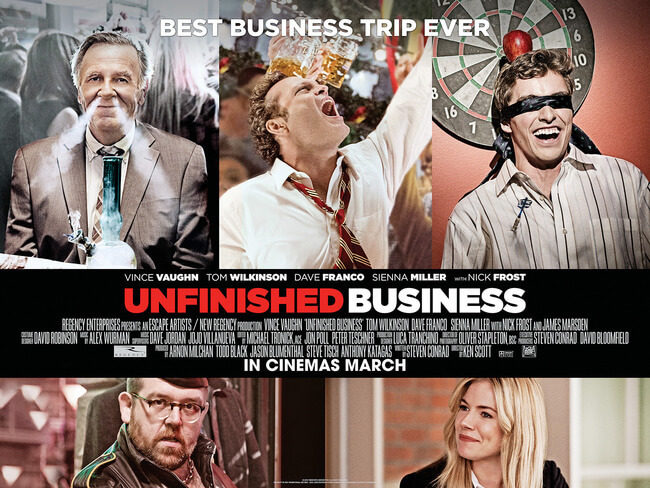 Unfinished Business does not even deserve to be called a movie, in any regard or form. It’s a pure scam, designed to con gullible audiences into handing over their hard-earned money with the promise that it will bring you an hour and a half’s worth of entertainment. Instead, you will be left with less money than you went in with, and a crushed sense of embarrassment from handing it over to something that does not deserve to be in as many cinemas as The Second Best Exotic Marigold Hotel, or any other film for that matter. It’s hard to know where to even begin with this – let’s try to start with the plot, or how there really isn’t one. The vague description that we gave at the top of this page has more meat to it, because that’s how thin the premise really is. Three guys go on a business trip… and that’s it. That is truly all we get in terms of story, meaning we as an audience are forced to sit there for an hour and a half watching them fumble around trying to conceive ninety minutes’ worth of material around such a weak premise. It doesn’t even make sense, for example these three businessmen have to travel to Berlin in order to attend an important business meeting, yet there’s a much simpler and cost-effective way of doing that and it’s called “video conferencing”. On top of that, hardly anything is resolved by the end, which features a stunning anti-climax with no build-up whatsoever, and multiple threads are left dangling for dear life by the time the first end credit mercifully shows itself. What makes it truly insufferable, however, is that it has all this time on its hands and yet it devotes NONE of it to its characters. You’ll come out of it knowing as much about these people as you did going in, since it offers no backstory for any of them, no defining character arcs, and we honestly don’t think they bother with even telling us their NAMES – save for Dave Franco’s character, whose name Mike Pancake lends itself to one of the many DOA running gags. Aside from that, there is nothing to be learned about any of these people and what we do learn we don’t care that much for anyway. Neither does the cast it seems, with every single actor feeling as if they’re being held hostage while on camera, including Tom Wilkinson (who we actually felt really sorry for while watching him try to manoeuvre around this kind of non-material that is simply degrading to such a great character actor) and Franco who seems woefully misdirected as a character who’s apparently supposed to be socially awkward but comes off more as being mentally challenged (and since he’s at the centre of many gross-out gags, it’s rather cruel when we are forced to laugh at his misery). Sienna Miller, James Marsden and especially Nick Frost are all completely wasted – both figuratively and literally, or at least we imagine they would be if they said ‘yes’ to this movie – while Vince Vaughn is stuck doing his old shtick but on a less successful level than even the likes of The Internship, a new low. The best sense we get of actual character is through Vaughn’s constant video-calls home to his family (done mostly to shamelessly advertise FaceTime), but even that offers no true insight to these characters and instead paves the way for a bizarrely out of place sub-plot that sees Vaughn’s kids being the victims of bullying at school. The film neither has the talent nor the emotional weight to carry such a sensitive topic as bullying, yet here it is presented in all its half-assed glory which is infuriating when you think of all the better opportunities one can think of to highlight such a sensitive issue with children. Perhaps the most insulting notion of all, however, is its complete and utter disregard for ANY sense of humour whatsoever. It’s as if the story elements were edited together first, but they sent it to the distributors forgetting to add the jokes. We’re serious, there is absolutely no effort put into any of these attempted moments of humour, which is baffling because the last film director Ken Scott made was Delivery Man – also with Vince Vaughn – and while not perfect it at least had actual jokes. This film, however, has absolutely nothing to offer to make any of its audience laugh, and we guarantee you will be left with the stony silence that haunted our screening. Even the jokes they do manage to sneak in are delivered so poorly and so forcedly with complete disregard for comedic timing, and its heavy fixation on gross-out gags involving natural body parts are just coarse instead of chuckle-inducing. Nothing in this movie is worthy of your facial muscles working to conduct a smile, let alone move at all to nearly form one. We don’t really want to say anything more about this tripe. Unfinished Business is beyond awful; it is an inanimate corpse, animated by electricity to entice moviegoers and then eat their brains. If we manage to find a film this year that’s worse and more unwatchable than this, we will be truly shocked. It is one of the worst comedies of all time, if not THE worst. 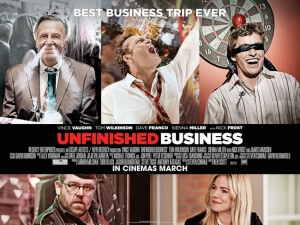 Unfinished Business, with its zero jokes, zero character, zero plot and zero anything else, is not just one of the worst comedies ever made, or (hopefully) the worst film of the year, but also one of the worst films, period. It is an utter disgrace to cinema, and should be not so much avoided but quarantined and left to die a slow and painful death.